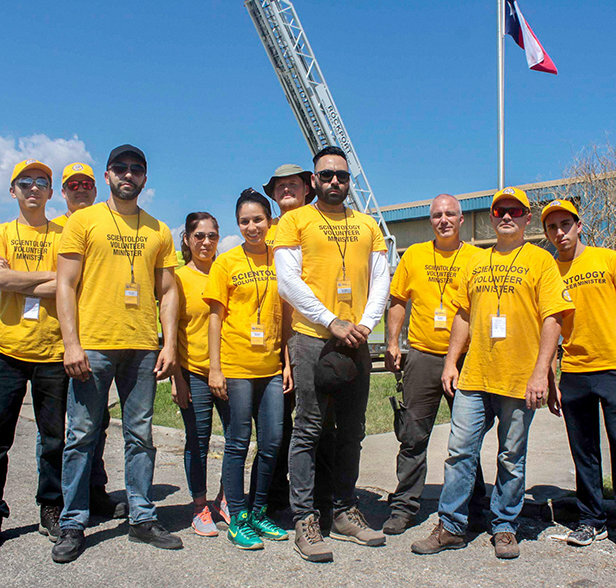 Paco (center in white long sleeves) stands with other Volunteer Ministers in Rockport, Texas, where they helped clear debris, rebuild houses and rebuild lives. Francisco “Paco” Cedeno Murillo volunteered for almost three months as a VM when disaster struck. A few years ago, however, one would hardly expect to see him there. “When I came to the United States, I left my country [Mexico] because I was trying to better my life, better myself. I was involved in gangs and into drugs,” he explains. “With the help of Scientology, I felt the urge to help others. In 2016, I decided to get involved with the VMs and started helping at a VM tent at the Martin Luther King Day Parade.” Paco soon became a regular, helping do VM seminars and putting up the tent at events in Los Angeles. It was when hurricane season struck that being a VM became his vocation. First Hurricane Harvey devastated southern Texas. Paco says, “I went over there and saw that I would be a huge asset in the efforts as I have extensive skills in construction. I was assigned to running the production and from this I saw that this is what I like doing. What impacted Paco the most were the people he helped: “A story that is embedded in my head and heart is, in Texas, we went to the home of a veteran. He was upset, nobody was helping him. We showed up and offered to help. He looked doubtful at first, but then I organized everyone, assigned the different functions and we all got to work. One VM gave the vet’s father a Scientology Assist and he started to do better. After Texas, Hurricane Maria devastated Puerto Rico. Paco was called again but this time to be the In-Charge of the whole VM effort. There was no way to refuse, “I just felt like Puerto Rico was something I had to do, there was no way I could say no. “So I just went and was there for two months. When we got there we first worked on clearing roads, removing debris and trees. In fact General Buchanan, the main In-Charge of the troops in Puerto Rico, mentioned us in a media interview. “He said that he was told by the people in the army that a group of people from the Church of Scientology came with a bunch of chain saws and just started cutting trees. After clearing roads, we started working on the food and water distribution lines and giving assists. “In Puerto Rico we went to so many municipalities, and we went to areas few others were going to. One town, Castañer, was a two-hour drive and when we got there the locals were amazed that someone came. We brought food and started to unload and it became a little fiesta. It was just amazing seeing their faces, they were so thankful.